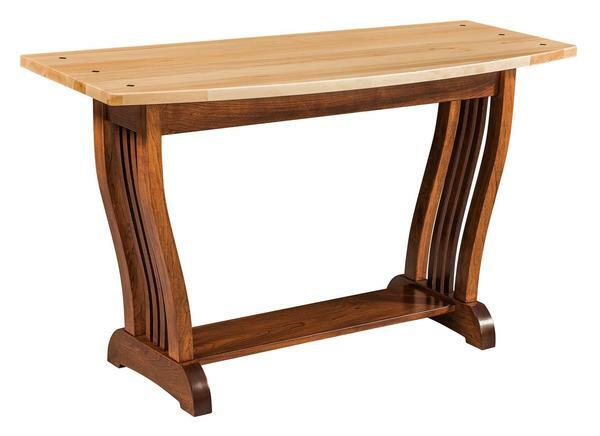 The Mission Sofa Table measures a generous 54" width offering plenty of tabletop space. Customers can choose to have this Amish Sofa Table handcrafted in their choice of Oak Wood, Brown Maple Wood, Rustic Cherry Wood, Quarter White Oak Wood and Cherry Wood. After an order is placed one of our sales staff will send you out finish samples to confirm your stain or paint selection. We want you to be 100% satisfied with the quality constructions on this Royal Mission Sofa Table and the beautiful finish. Please call with questions and ordering assistance for our Royal Mission Sofa Table. Coffee Table and End Table are Not Included in Price.